I put attack in there, because of the power on Krug's Card "Double Attack", eventhough it is not a special attack, it has referenced the word attack already. Let me explain it this way: Changing the power names to "Overwhelm" and "Ambush" would still carry the full freight of meaning, whereas changing the power names to "Pack" and "Double" would make them simply confusing. And redundancy is undesirable. Kinseth, if you are persuaded, please say so. I do not want to have a big debate later because we were too cavalier to make an obvious improvement now. Thanks for the explanation , that works for me. I'll update the visual card when I get a chance. Last edited by Kinseth; June 13th, 2015 at 06:12 PM. Reason: Changed to be straight to the point. Updated the cards , removing Attack from Ambush Attack and Overwhelm Attack. Oddly enough, I originally did not have Attack in either power. A couple of action shots of the Gnolls vs some Humans. The Retchtongue Warband has received 4 Yea votes to review (capsocrates, Scytale, Son of Arathorn, and Soundwarp SG-1) and moves forward in the process. 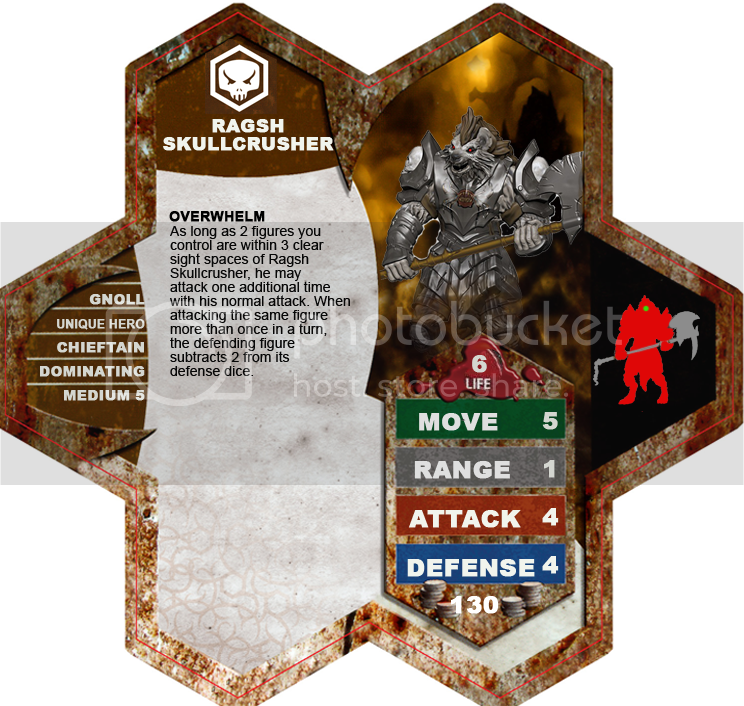 Ragsh Skullcrusher has received 4 Yea votes to review (capsocrates, Scytale, Son of Arathorn, and Soundwarp SG-1) and moves forward in the process. 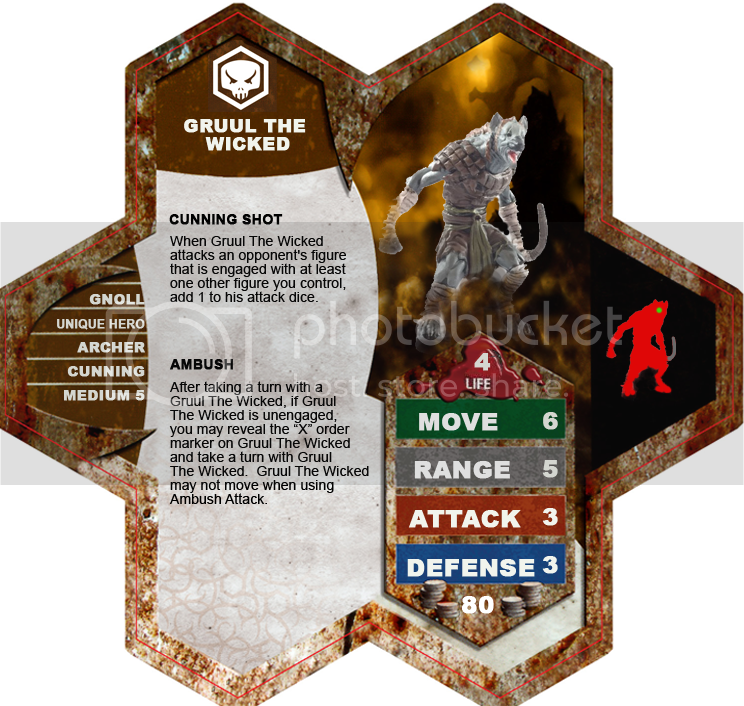 Gruul the Wicked has received 4 Yea votes to review (capsocrates, Scytale, Son of Arathorn, and Soundwarp SG-1) and moves forward in the process. I think that the open mouthed gnoll in the top center on the warband sticks out from the other two. If that's the best you have access to though, beggers can't be choosers. Just my opinion. I'm back! Wanted to try Rampage again with some more tweaks. Balance- His points put him in the same range as units such as Agent Skahen, Krug, Tagawa Samurai and Nakita Agents. I feel this is an appropriate place for him given the combination of benefits and risks inherit in his powers. Playability- Yes its powers and Master stats are appropriate as it uses examples for already existing figures and follows the trend of other Barbarians in game. Though it has the same pose as some of the Warforged Soldiers the brown plating really does help it stand out from the blue painted variety. 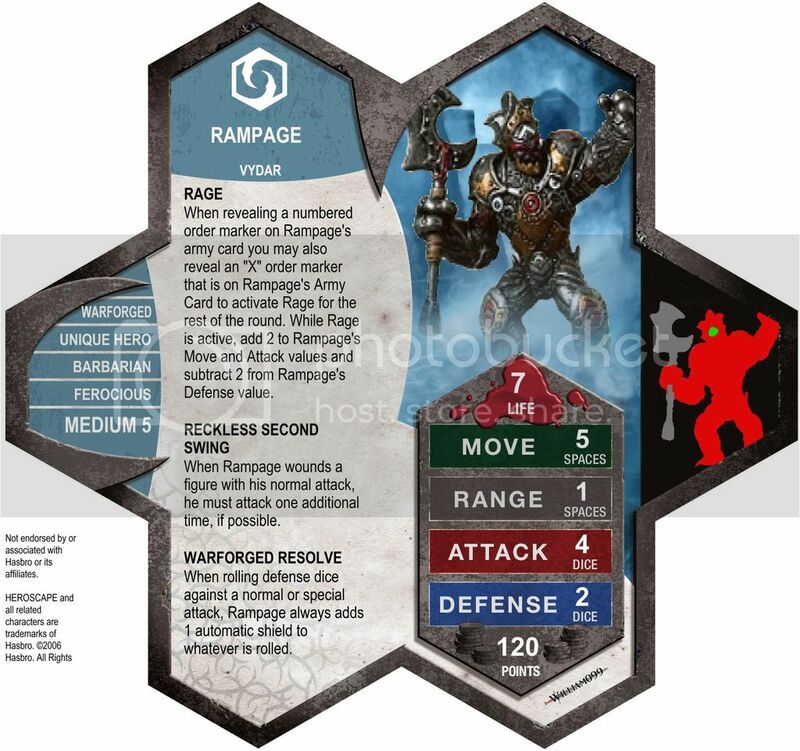 Creativity- An inverse of Siege's Crag of Steel plus the blending of previously existing powers and master stats make for a fun unit, that does bring a new twist to the Barbarian and Warforged groupings within the game. Theme- Warforged and Barbarians are both currently present in the game and the focus here gets closer towards previous HS barbarians. Repaint of the Warforged Soldier sculpt, according to previous HS precedent. Unless I misunderstand something, that doesn't sound very "accessible" in the C3V/SoV sense. A quick check of eBay would seem to make this something like a $16-18 acquisition, and right now only 2 Warforged squads are available. It's a fine custom, but wouldn't the figure need availability at least in the dozens and a price tag far below $18 to be an SoV candidate? I think William099 is saying that it's a "repaint," so you could use your own Warforged if you wanted in its place. That would be fine with me, but it's up to the judges how they want to handle it. 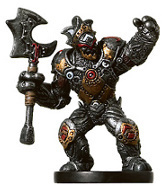 D&D War Drums Warforged Captain is an option here as well.